About the photo - Light from the windows made this shot more difficult to show details. The trees actually live on the rack in the window to the left. 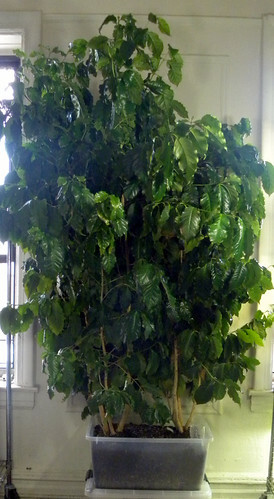 The objective is simply to show the quality of these coffee trees growing in a planter with no drainage. Click on the photo to view larger sizes on Flickr. Click on Actions for the menu that includes "View all sizes". About the plants - These are a couple of coffee trees (probably Coffea arabica spp.) growing in a sub-irrigated planter (SIP) made from a storage box. They were 4” pot size plants from Lowe’s purchased back in October 2006 that looked similar to the photo. They have never seen a drain hole since. No drainage! They were combined into the current SIP on February 15, 2010. My how they have grown in just 5 years. About the growing method – The sub-irrigated planter (SIP) was made from a translucent storage box. The internal plumbing consists of a recycled juice bottle, inverted nursery flat and water bottle fill tube. No need for power tools. Since it is an indoor plant, I did not include an overflow drain hole. A scale or a soil probe is the best way to measure soil moisture for indoor plants growing in subdued light. In this case it is also helpful that the planter is translucent. I can see the soil moisture at a glance. More about the big deception – The vast majority of gardeners who read houseplant and gardening books would say, “You can’t do that, you need a drain hole!” They will also say that so-called “self-watering” planters are only for moisture loving plants or for when you go on vacation or a business trip. Spend some time on houseplant forums such as GardenWeb and Dave’s Garden and you will soon find this to be true. I have done it, but not any more. While many of the folks on garden forums may not have much formal science education, they are not stupid people. It is simply that our horticultural education system is broken. As a long time industry insider, I know that much of the misinformation and disinformation is intentional and that bothers me greatly. It did not matter as much to me when it only involved decorative plants. Now it involves hunger, obesity, job creation, environmental concerns such as water wastage and the health threat from contaminated city soil and more. I plan to escalate this issue to the highest levels of government. If you care about doing the right thing, please join in this effort. Even Tweeting helps. I may be speaking naively but I still believe there is power in public awareness.